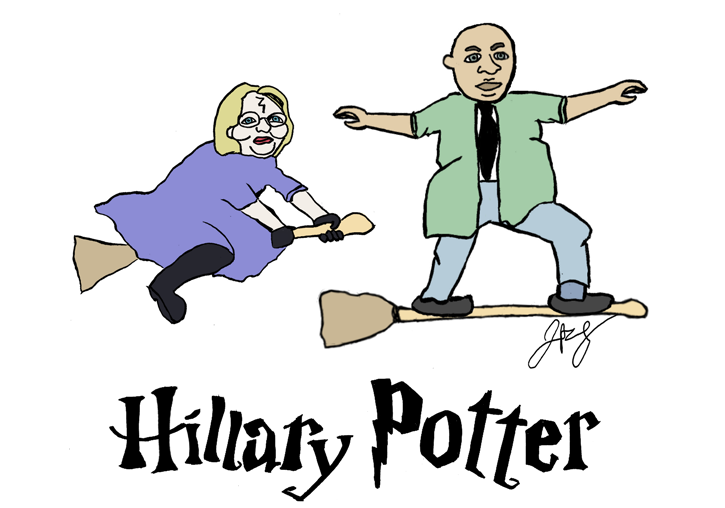 Hillary Potter was, she knew, one of the most successful woman wizards ever to exist. Yet she also knew from various polls that she had high unfavorability ratings in the wizarding world. These two things were likely not a coincidence. Perhaps when she chose her partner for the Democratic Magical Convention, she would pick somebody with some pizazz to help her with her marketing problems. Nobody on Hillary’s short list had more pizazz than Coriander Booker. His charm was so plentiful that many suspected he didn’t even need a wand to work magic. He also had a common person’s touch that endeared him to many. Once he even rescued a cat from a burning cottage, though it later turned out to be an unregistered animagus. On top of these qualities, he was moderate, uncontroversial, and would help to increase turnout in the Black, vegan, and teetotaller wizarding communities. The only problem was that Booker was from New Jersey. Story, calligraphy, and cartoons by Jeremy Pegg, known in the real world as Jeremy Peter Green, trademark attorney and founder of JPG Legal. Green files trademark applications for small businesses, intellectual property law being a natural path for a former cybersquatter. Note the cartoonish branding of some of his trademark offerings, particularly MarkHound.